In seawater, CO molecules are present in three major forms: the undissociated species in water, [CO ]aq, and two ionic species, [HCO ] and [CO ] (Figure 1). The concentration of [CO ]aq depends upon the temperature and chemical composition of seawater. 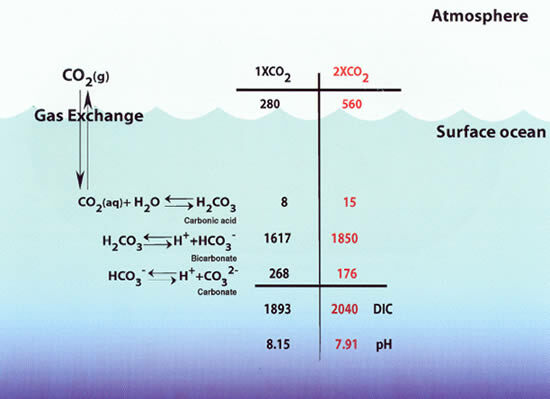 The amount of [CO ]aq is proportional to the partial pressure of CO exerted by seawater. The difference between the pCO in surface seawater and that in the overlying air represents the thermodynamic driving potential for the CO transfer across the sea surface. The pCO in surface seawater is known to vary geographically and seasonally over a range between about 150 µatm and 750 µatm, or about 60% below and 100% above the current atmospheric pCO2 level of about 370 µatm. Since the variation of pCO2 in the surface ocean is much greater than the atmospheric pCO seasonal variability of about 20 µatm in remote uncontaminated marine air, the direction and magnitude of the sea-air CO transfer flux are regulated primarily by changes in the oceanic pCO . 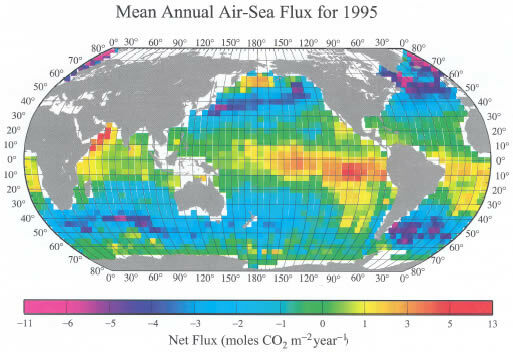 The average pCO of the global ocean is about 7 µatm lower than the atmosphere, which is the primary driving force for uptake by the ocean (see Figure 6 in Karl et al., this issue). The pCO in mixed-layer waters that exchange CO directly with the atmosphere is affected primarily by temperature, DIC levels and A . While the water temperature is regulated by physical processes, including solar energy input, sea-air heat exchanges and mixed-layer thickness, the DIC and A are primarily controlled by the biological processes of photosynthesis and respiration and by upwelling of subsurface waters rich in respired CO and nutrients. In a parcel of seawater with constant chemical composition, pCO would increase by a factor of 4 when the water is warmed from polar temperatures of about –1.9°C to equatorial temperatures of about 30°C. On the other hand, the DIC in the surface ocean varies from an average value of 2150 µmol kg in polar regions to 1850 µmol kg in the tropics as a result of biological processes. This change should reduce pCO by a factor of 4. On a global scale, therefore, the magnitude of the effect of biological drawdown on surface water pCO is similar in magnitude to the effect of temperature, but the two effects are often compensating. Accordingly, the distribution of pCO in surface waters in space and time, and therefore the oceanic uptake and release of CO , is governed by a balance between the changes in seawater temperature, net biological utilization of CO and the upwelling flux of subsurface waters rich in CO .